In the rear view mirror, 2nd quarter GDP was revised upward to +1.3%. The Chicago PMI for September came in at a strong 60.4. Durable goods for August declined slightly, but were well ahead of expectations. One consumer confidence measure showed slight improvement, but the other continued to decline, as did the forward looking expectations gauge. Personal income also declined, and spending was up no more than inflation. Many of these measures owe their recent cliff-diving to the Washington debt debacle. Not coincidentally the ECRI forecasting service made an official call that a new recession was about to begin. So congratulations are in order for those Beltway participants who wanted to induce a new recession for their own partisan gain. May they go to a deeper ring of hell. Many of the high frequency weekly indicators actually rebounded this week, while several continued to signal contraction. On the jobs front, the BLS reported that Initial jobless claims fell 32,000 to 391,000. The four week average decreased to 417,000. The BLS reports that seasonal factors influenced this week's number, but this is still welcome, and is the lowest number in 6 months. The American Staffing Association Index increased two points to 90. This is the first time that this series has broken out of its 87-88 range after 3 months. That's good news, but there is a big upside seasonal effect at about this week every year, so extra caution is necessary. On the other hand, adjusting +1.07% due to the 2011 tax compromise, the Daily Treasury Statement showed that for the first 20 days of September 2011, $128.1 B was collected vs. an identical $128.1 a year ago. This comes after several actual negative readings and so continues as an ominous sign for jobs. Housing had a reasonably good week as well. The Mortgage Bankers' Association reported that seasonally adjusted purchase mortgage applications increased 2.2% last week. On a YoY basis, purchase applications were up 0.1%. The decline in applications has ended for two weeks, and in a longer term sense purchase mortgage applications have essentially been flat for the last 16 months. Comparisons will get more challenging in the next few months. Refinancing increased 11.2% w/w with record low interest rates. As to housing prices, YoY weekly median asking house prices from 54 metropolitan areas at Housing Tracker showed that the asking prices declined -1.4% YoY. This is yet another record smallest YoY decline in the 5 1/2 year history of this series (YoY measurements were possible beginning in April 2007). The areas with YoY% increases in price decreased by one to 14. The areas with double-digit YoY% declines remained at only 2. If the current trend continues, nationwide asking prices will be YoY positive by the end of this year. Rail traffic also had a good week. The American Association of Railroads reported that total carloads increased 1.8% YoY, up about 10,000 carloads YoY to 553,500. Intermodal traffic (a proxy for imports and exports) was up 7000 carloads, or 3.0% YoY. The remaining baseline plus cyclical traffic increased over 3000 carloads, or +1.1% YoY. Keep in mind that Rail traffic has been negative YoY for 6 of the last 12 weeks. Most of the remaining series were neutral. The Money supply surge appears to have ended. M1 was flat for the week. It remains up 0.6% m/m, and 19.1% YoY, so Real M1 was up 15.3%. M2 declined -0.1% w/w. It remained up 1. 0% m/m, and 10.2% YoY, so Real M2 was up 6.4%. The YoY increase in both M1 and M2 nevertheless continue near historic high levels. Retail same store sales had another mixed performance. While the ICSC reported that same store sales for the week of September 24 increased 2.7% YoY, and decreased -0.2% week over week, Shoppertrak reported that YoY sales only rose 1.9% and also increased 0.8% week over week. Weekly BAA commercial bond rates decreased .15% to 5.18%. Yields on 10 year treasury bonds also decreased .15% to 1.88%. The spread between the two rates did not increases, but the trend of continuing overall weakness continues. The most negative reading again goes to Oil, which finished at ~$79 a barrel on Friday, only slightly less than one week ago. This remains close to its 24 month low. This is about $15 below its recession-trigger level. Gas at the pump fell $.09 more to $3.51 a gallon. Measured this way, we probably are still about $.20 above the 2008 recession trigger level. Gasoline usage was down -4.5% YoY, at 8964 M gallons vs. 9383 M a year ago. This is a firm recessionary reading. Paul Kasriel's post WW2 infallible recession warning indicator was predicated upon a negative real M1 and an inverted yield curve. Neither of those conditions obtain now. The Confidence Board's LEI have also not turned negative. ECRI is clearly relying on pre-WW2 type of criteria, presumably having to do in the greatest part with manufacturing. They also specifically referenced falling sales. My biggest concern in the wake of the debt ceiling debacle has been whether or not the destruction of confidence and the pullback in manufacturing would become self-reinforcing or not. ECRI clearly believes they are so becoming. I suggest that the biggest clue this coming week will not be the jobs report, but rather auto sales which will be reported Monday. A long time ago in a galaxy far, far away (actually, Austin, Texas in the early 1990s) I was a professional musician. I even went to GIT. 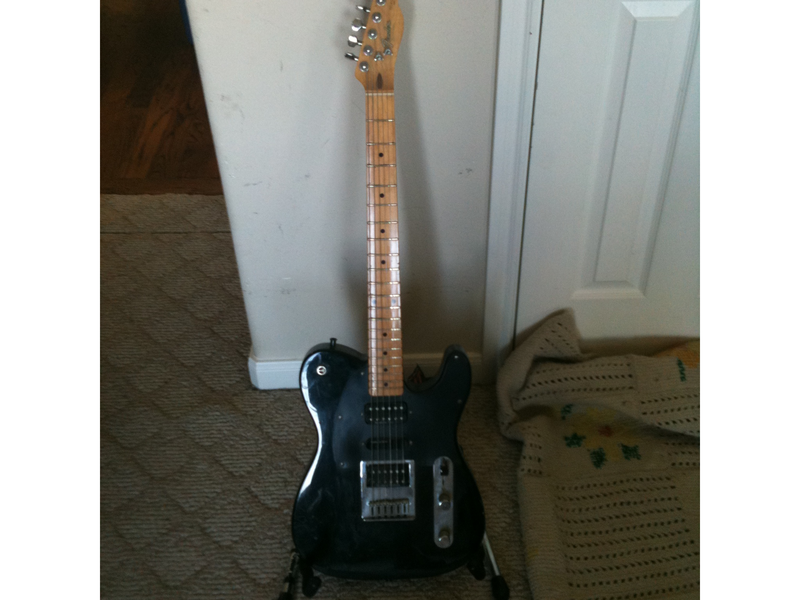 This was one of my guitars -- which I obviously still have. I got the idea for it from Jeff Beck in the Secret Policeman's Other Ball. Seymour Duncan has now issued a limited edition of the same guitar. Anyway -- it's a great guitar. Just wanted to do something different today. Have a good weekend. European inflation unexpectedly accelerated to the fastest in almost three years in September, complicating the European Central Bank’s task as it fights the region’s worsening sovereign-debt crisis. The euro-area inflation rate jumped to 3 percent this month from 2.5 percent in August, the European Union’s statistics office in Luxembourg said today in an initial estimate. 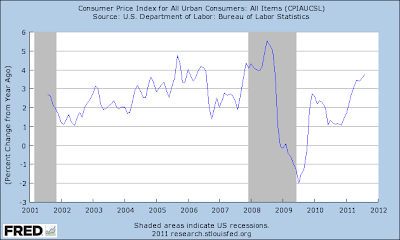 That’s the biggest annual increase in consumer prices since October 2008. Economists had projected inflation to hold at 2.5 percent, according to the median of 38 estimates in a Bloomberg survey. ECB President Jean-Claude Trichet, who will retire at the end of October, said on Sept. 8 that inflation rates are “likely to stay clearly above” 2 percent in the coming months before falling below the central bank’s ceiling in 2012. This assessment is based on “moderate economic growth,” he said. Trichet will be succeeded by Italy’s Mario Draghi. Members of the central bank and other policy markers are hoping that the "cure for higher inflation is higher inflation." Put another way, higher prices decrease demand, thereby lowering price pressure. Supporting this is the strengthening dollar, which will lower the price of commodities, all of which are priced in dollars. However, inflation is a becoming a bigger concern of mine, largely because of agricultural price pressures across the globe. We've seen truly bizzare weather over the last year play havoc with crops. India and China are adding extremely strong pressure to the demand side of the equation, pulling the demand curve to the right. And there is only so much yield to expect from crops. In short, I'm not seeing enough relief in this area of warrant a calmer inflation outlook just yet. Will Food Inflation Be A Continuing Problem Going Forward? 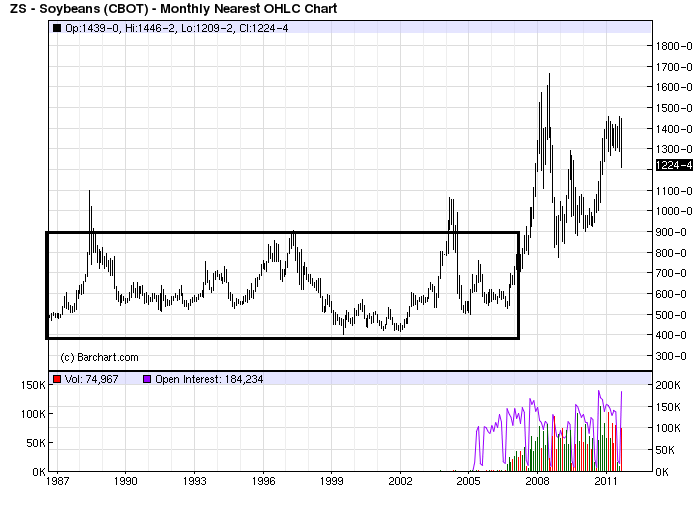 Consider the following charts of the grains when looking at inflation. 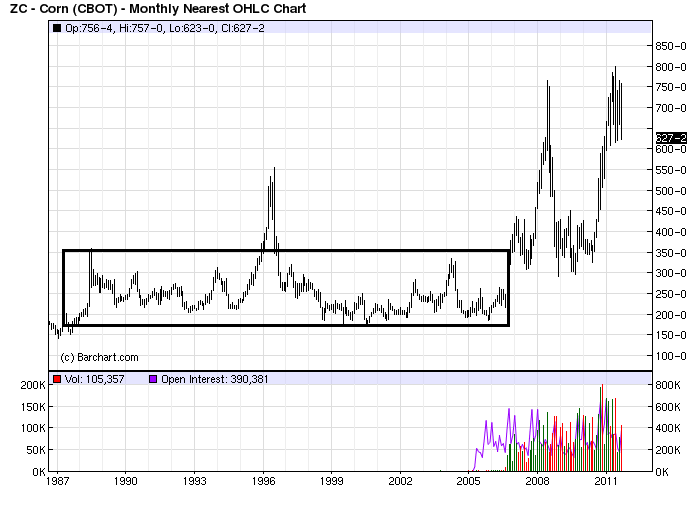 Above is a 25 year chart of wheat. Notice that for nearly 20 years, it fluctuated in a range between 2.25 and 5.00 per bushel. 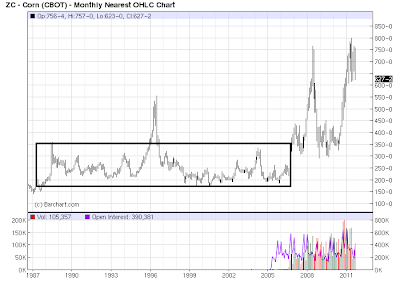 Now $5 is the floor of a new trading range that has seen spikes to over 13 bushel. 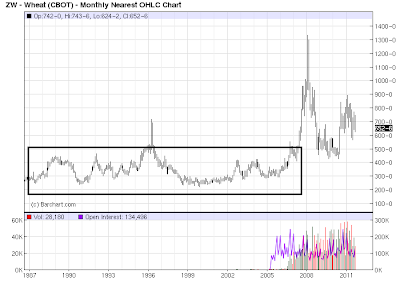 Soy beans traded in a range of roughly $4-$10 for roughly 20 years. Now they trade in a range of $8 -$16. Corn traded in a range between $2 - $2.50 for nearly 20 years whereas now it's trading in a range of $3.50-$7.50. 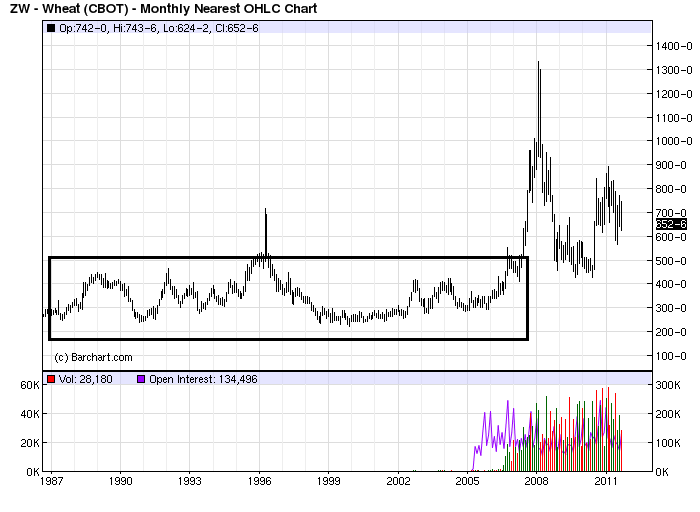 With corn, keep in mind that ethanol is helping to goose prices. An old trading adage is the longer the base the better the rally or fall from the base. Should that hold here, we've got 20 year bases from which to rally. That's a pretty large base to rally from. Why the increase? Remember that the standard of living is increasing for billions of people in India, China, Brazil and Russia, meaning their respective diet is changing. That means the global demand curve has shifted out (to the right), increasing prices. Additionally, we've also had a year of really odd weather, starting with most of Russia being on fire last year. My state (Texas) is in the middle of a terrible drought negatively impacting the cattle business. This means supply is growing slowly. In short, food inflation will probably be a story going forward, given the above charts. Let's start by looking at the SPYs EMAs. Think of each of these as a trend line representing various time periods -- that is, the 10 day EMA represents a short term (2 weeks), the 20 a bit longer (1 month) etc... First, note the longest trends -- the 50 and 200 -- are moving lower a fairly sharp rates. This tells us the longer trend is hardly positive. Prices are intertwined with the 10 and 20, and prices are using the 50 day EMA as technical resistance. Most importantly, the shorter EMAs are below the longer EMAs, which is a very bearish development. Overall, the EMA picture is extremely negative and bodes for a further sell-off if the 112 price area does not hold. The price action for the IWMs is a bit more negative, with the shorter EMAs moving a bit lower at a more sharp angle. Prices are also closer to technical support. Take a closer look at the recent action in the euro. Prices have fallen sharply; they have moved through key support -- all the EMAs and a very important multi-year trend line. All the EMAs are now moving lower, the the shorter EMAs are below the longer EMAs and prices are using the EMAs as technical resistance. This is a very sharp reversal of fortune which was caused directly by the WU debt crisis. In contrast to the FXEs we have the dollar, which has rallied through the 200 day EMA and broken through important technical resistance levels. The 10 day EMA has moved through the 200 day EMA, with the 20 on the verge. The 50 is moving higher as well and the 200 day EMA has leveled off. The dollar has become the safe haven currency by default. While copper's fall should have a depressing effect on manufacturing inputs, the above 2 charts indicate we probably won't see the same effect in food prices. Over the last week, I've looked at the various arguments advanced by the three Fed governors who voted against further Fed action (see here, here, and here). Here I want to sum up these arguments into two categories: those that make sense, and those that don't. 1.) The fed is already at the end of what is can do; any new policy will only help at the margins. This was advanced by Fed president Fisher and Plosser. Fisher noted the Fed has already flooded the economy with money and yet few loans are being made. Plosser noted that interest rates were already at incredibly low levels. Therefore, lowing them an additional 10-20 basis points would only help at the margin. Both of these arguments acknowledge a basic -- and important -- point: there is a limit to what central banks can do. These also highlight another important point: how far outside of the box should the Fed go in its efforts to stimulate the economy? Is a large scale asset purchase program warranted or prudent? These are important questions that should be honestly and openly debated. I should add that I support Bernanke's asset purchase program, but understand what these dissenters are saying and respect their logic. 2.) Inflation is running hotter than we'd like. This was advanced by Plosser and Kocherlakota (oddly, Fed President Fisher disagreed). This is a point I've made here as well, largely based on food prices. Overall YOY CPI is running at 3.8%. 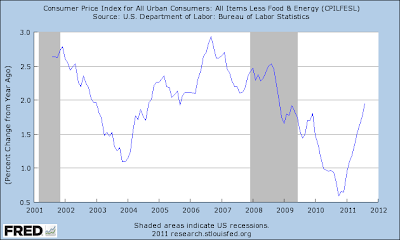 And while energy prices are dropping, food prices are stubbornly high right now. At this point we need to ask the question, "how much inflation is good and how much is bad?" There is no correct answer for this; it's really one of scaled degree. However, I believe this is also a legitimate argument. 1.) Government can't help. This was advanced by Plosser and, to a lesser extent, Fisher. I could not disagree more strongly. While certainly not the be all and end all, governmental action can help in many ways. A classic example is the New Deal -- which essentially restored US growth by 1937 to pre-depression levels. Also look at China's response to the recession -- they went on a spending binge and are now printing growth in the 8%-10% range. In short, stimulus spending works and has been proven to work in several important historical examples. Conversely, European countries that are engaging in austerity measures are seeing their growth contract. 2.) What's really holding back hiring is too much regulation. This argument was advanced by Fed President Fisher. unfortunately, the data does not support this argument. The reality is regulations are a zero sum game: yes they do destroy jobs BUT they also create more or less the same amount of jobs lost. As I pointed out in another article, according to the BLS labor data, only .2% to .3% of jobs lost in the mass layoff data were lost due to regulation. What we see above is a mix of pure policy and politics. There is nothing extraordinary about the arguments; but they are worth considering. In yesterday's market wrap, I commented on the importance of looking at more than 1 equity market -- especially the risk based markets such as the IWMs. 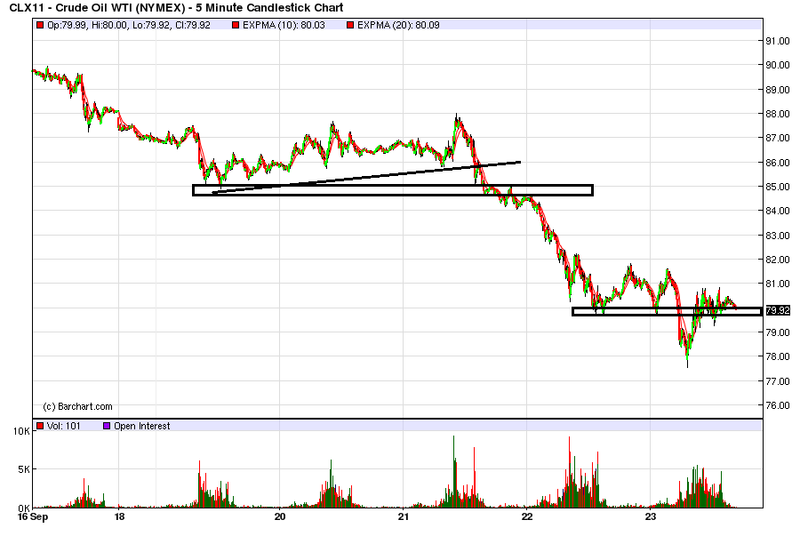 Yesterday we see that prices retreated to support levels, printing a strong bar. This is a very important development, because it indicates investors are moving from the more risk prone areas of the market -- especially when times get bad. The IEFs are right at support. This is a very interesting development, as the IEFs have been a beneficiary of the "flight to safety. However, prices have been inching up, not rallying strongly. Remember that the 10 year is in fact at a negative yield after accounting for inflation, thereby making the rally one entirely oriented towards capital gains. At some point, the negative yield will get noticed by investors. Oil is still in a very negative position. 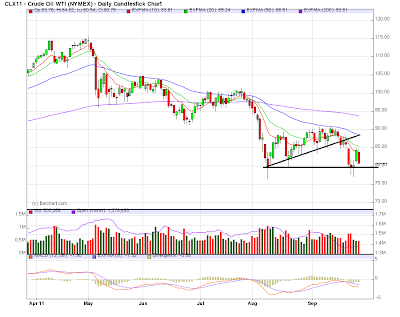 After breaking an upward trendline, prices have run into support at the 80/bbl level. They tried to bounce higher yesterday, but couldn't move beyond the 10 day EMA. With all the EMAs above prices -- and traders concerned about the pace of economic activity, there is little hope for a strong oil rally anytime soon. How long do you suppose until any of the mainstream media picks up on the fact that housing prices have, in fact, NOT been declining for the last half year? Now, I realize everyone "knows" that house prices are declining. Unfortunately reality since the beginning of this year has not been conforming to what everyone "knows." If this rate of second derivative improvement continues, we could see a YoY increase in asking prices nationwide before the end of the year. If so, that would mean the nominal bottom in housing prices has already occurred -- perhaps last January (because of the strong seasonality in housing prices)! Additionally, as Calculated Risk notes, Housing Tracker's updates continue to show that inventory is also declining. Note that Housing Tracker is current through last week, vs. yesterday's Case-Shiller report, which is an average of May, June, and July. The variation in the index over the last 7 months is less than 1%, and on a seasonally adjusted basis we have not made a new low in 4 months. In fact we are above the low this index made in May 2009 (before most of the $8000 housing credit distortions kicked in). Additionally, I've been expecting the YoY% change in the Case-Shiller index to bottom and turn up to confirm the Housing Tracker data, but with a few months' lag. In fact it does appear that the YoY% declines in the Case-Shiller index troughed in May (actually an average of March, April, and May) and are trending slightly higher since then. So the turn in the Case-Shiller index is confirming the leading value of Housing Tracker's asking price data. In short, both Housing Tracker and Case-Shiller support the view that a bottom in house prices was probably made early this year. I do expect "real" as opposed to nominal prices to continue to decline, but this decline will be due primarily to inflation, not declines in actual prices. A rejoinder can and has been made that increased foreclosure activity will cause this bottom to be temporary. That could be, but as to that, here are a few important points: (1) we need to start with the truth, which is that house prices have basically stopped falling this year, and proceed to estimate the impact of renewed foreclosures from there; (2) the effect of foreclosures ought to be measured in terms of supply, as in, "An X increase in supply due to foreclosures will result in a Y reduction of price compared with otherwise." Bloviations are not hard data; and (3) how many foreclosures will hit the market over what period of time? A sharp temporary increase followed by a long minor increase will presumably have a markedly different impact than a steady and substantial but reduced stream. Note that an increase in foreclosures might simply mean a longer flat period of nominal prices, rather than a renewed actual decline. But let's start with the truth: in 2011 house prices have stopped declining. In February, Professor Shiller startled those looking for an imminent "bottom" in house prices by suggesting that house prices could still fall 10% to 25%. He's standing by that assessment. House prices won't necessarily plunge from here in nominal terms, but in real terms--after adjusting for inflation--they could still drop significantly. And yes, the comments are Business Insider are unintentionally funny. If widgets sold for $100 a year ago, and are $98.30 now, but were $90 in March, then they already made their bottom. This is the caution I always make about YoY data. 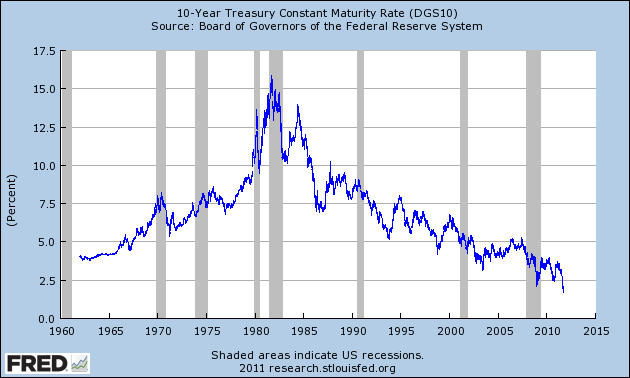 Interest rates are near 50 year lows. The governor also used the phrase "at the margins" several times to suggest that the Fed action could help in a small way, but realistically couldn't do much more. And, in effect, what is the real difference between a 2% 10 year and a 1.9% 10 year. -- He expressed the opinion that government couldn't help in a big way with the unemployment situation, but could help with some of the structural issues such as retraining etc.. That is, government couldn't help to meaningfully lower the unemployment rate, but it could provide services to help the process along. 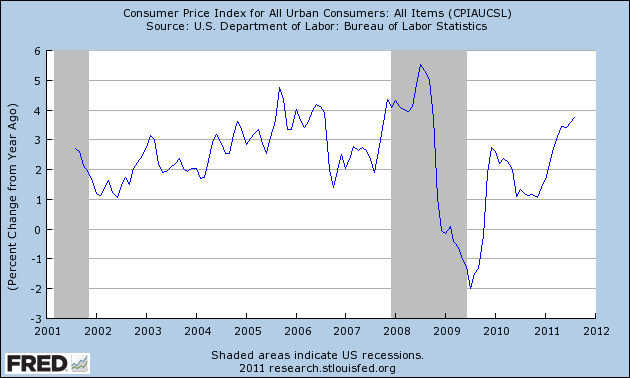 Note that total CPI is now nearing 10 year highs. Interestingly enough, one of the interviewers also mentions food prices as a primary problem, which I've mentioned several times before. While I don't agree with Plosser's overall assessment, I do think his position is well-thought out and deserves scrutiny. The above charts show why it is so important to look at several equity markets rather than just one. The news stories will focus around the SPYs (the lower chart). Prices there have bounced from a technical level (the 112 area) and moved through the 10 and 20 day EMA. Volume could be better, but the end result is prices are now above the 20 day EMA However, the IWMs (the top chart) represent equity risk appetite. Notice that prices have moved below previous support levels, bounced a but higher but printed very weak bars to get there. Prices are just above the 10 day EMA and have printed a spinning top -- a very weak candle. In short, until we see the risk based equity market advance on strong volume and strong bars, I'm not impressed. This is another concerned chart: copper has literally fallen off a cliff on very high volume. Prices have also gapped lower several times over the last few weeks. All the shorter EMAs have moved sharply lower and are through the 200 day EMA. In short, this is a very bearish chart which is very concerning considering copper's overall economic importance. The longer end of the Treasury curve is moving higher in a channel. The IEFS channel has a slight angle, while the TLS is pretty sharp. However, notice the IEFs have advanced in a very small range -- a range of 2 points. These charts also indicate the equity market rally is weak, as there is not a significant flight from the Treasury market into equities. Last week I looked at Fed President Fisher's argument for not engaging in further Fed policy easing. While part of his argument made sense (the Fed had already done all it could do) part of it did not (that regulatory burdens were hindering a hiring increase). Today I want to look at Minneapolis Fed President Narayana Kocherlakota's argument for not engaging in further Fed policy easing. Much of my discussion so far has been a look back over the past three and a half years, since the start of the Great Recession in December 2007. My assessment is that, despite some profound economic shocks, the FOMC—led by Chairman Bernanke—has successfully met its price stability mandate by engaging in imaginative forms of monetary accommodation and thereby helped lower the unemployment rate. Now I’d like to turn to my assessment of the most recent round of FOMC decision-making. To put this part of my talk in the proper context, I want to ask another key question: How did the FOMC achieve its success over the past three and a half years with regard to price stability? But here’s one instance in which most of the rules do deliver the same recommended course of action. Suppose the FOMC observes an increase in available measures of inflationary pressures and a decrease in labor market slack—that is, the gap between maximum employment and observed employment. Then many monetary policy rules would recommend that the FOMC not ease policy further and in fact consider reducing the level of monetary policy accommodation. That recommendation—don’t ease further if you’re doing better on your mandates—makes sense to me. With that recommendation in mind, let’s go back to November 2010. At that date, the FOMC took a significant policy step by announcing its intention to buy $600 billion of longer-term Treasury securities. Until the most recent meeting in August, this was the last major policy step undertaken by the Committee. What did available measures of inflationary pressures and labor market slack—the “mandate dashboard”—look like back in November? In terms of inflation, I generally think that core inflation does a better job of tracking underlying inflationary pressures, because it does not include the highly volatile and transitory fluctuations in food and energy prices. In November, PCE core inflation over the preceding 12 months had been less than 1 percent and had decelerated throughout the year. Of course, a good mandate dashboard should also include some measure of the future course of inflationary pressures. Here, it is worth noting that, even with the large-scale asset purchase in place, FOMC participants expected core inflation to remain very low: less than 1.3 percent over the upcoming calendar year of 2011. In terms of labor market slack, I’ve argued elsewhere that it’s hard to find reliable measures of this key variable.8 But the FOMC statement makes specific reference to the unemployment rate as a gauge of labor market slack, and so I’ll use that measure on my notional mandate dashboard. The unemployment rate was 9.8 percent in November 2010. With the help of the large-scale asset purchase, FOMC participants expected it to fall to about 9 percent a year hence. Let's stop and take a more thorough look at the situation in 2010. First, note there are two variables he's looking at: inflation (as expressed by the PCE core inflation number) and labor market slack (as defined by the unemployment rate). At this time, inflation is running at less than 1.3% and unemployment is at 9.8%. 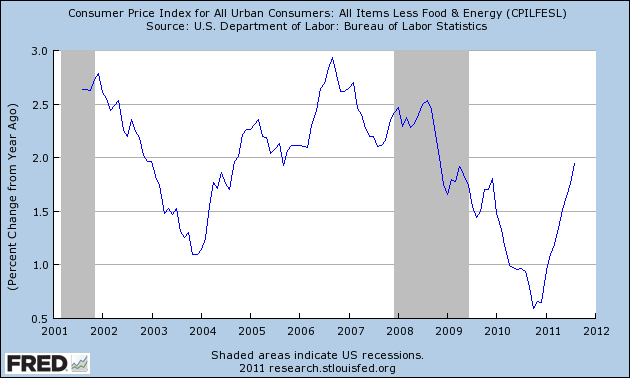 From his perspective, inflation is low and labor slack is high, so it's OK for the Fed to act. How had the mandate dashboard changed in August 2011? PCE core inflation rose sharply: From December 2010 through July 2011, the annualized core PCE inflation rate was over 2 percent. FOMC participants did not submit forecasts of core PCE inflation in August. However, the most recent Survey of Professional Forecasters, done before the August FOMC meeting, predicted that core PCE inflation will average 1.7 percent in 2011 and 1.6 percent in 2012. It seems clear that inflationary pressures were higher in August than in November. My own current forecast for core PCE inflation is even higher than the SPF’s—I expect that it will average around 2 percent per year over 2011 and 2012. What about labor market slack? The unemployment rate was 9.1 percent in August 2011, as opposed to 9.8 percent in November 2010. Again, we don’t have FOMC participant projections available from the August meeting. However, the Survey of Professional Forecasters predicts that unemployment will be 8.6 percent in just over a year’s time. Going into the August FOMC meeting, my own forecast for unemployment was a little more optimistic, in the sense that I do expect unemployment to be under 8.5 percent by the end of next year. But, even with the more pessimistic SPF forecast, labor market slack is smaller than in November 2010, when the FOMC expected unemployment to remain around 9 percent in a year’s time. So, measures of past and forecasts of future inflationary pressures were higher in August than at the time of the FOMC’s last major policy move in November. Measures of current labor market slack and expectations of future labor market slack were smaller in August. The monetary policy rules that I described earlier would suggest, again, “Don’t ease further if you’re doing better on your mandates.” Indeed, they’d recommend that the level of policy accommodation be reduced. Flash forward to the last meeting when core PCE was over 2% and unemployment had moved lower to 9.1% with further projected increases in PCEs and declines in unemployment over the next 6-12 months. The question now becomes: is this an appropriately high level of inflation to be concerned about higher prices and a declining unemployment rate to think more can not be done? As I've noted, inflation is running at hot levels, so I think this is a valid concern. 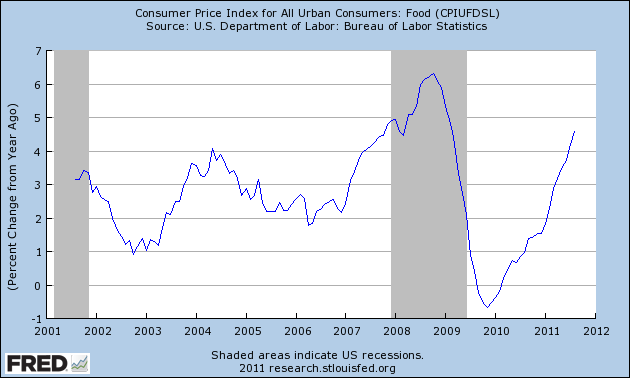 Most importantly, I'm concerned about food prices maintaining increased pressure on the CPI number. However, arguing there is a sufficient drop in unemployment to indicate a decreasing of labor market slack is a non-starter -- especially considering the length of time of many of the unemployed. Simply put, unemployment is still way too high to considering making this argument viable. As such, I don't think it holds up as indicating slack in decreasing in a sufficient degree. I will add that I think if he had stuck with inflation, and then pointed to overall CPI plus food prices (which are running very hot as noted at the above link) he would have been on sound ground. 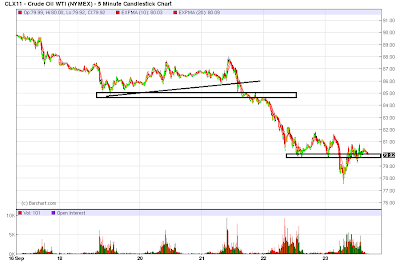 As Barry said yesterday, it's all about the bounce -- or, more specifically, the price action from the 112 are. This is the third time prices have hit the 112 area. In trading parlance, that means we really, really really need to see prices make a strong advance through the EMAs or we've probably got serious problems. Yesterday's bar was fairly strong, but it hit resistance at the 10 day EMA and printed on fairly weak volume. The tehnicals are fair. The A/D and CMF show money moving into the market, but the MACD is in negative territory and has given a sell signal. Additionally, the overall macro environment is extremely bearish, meaning traders are more likely to sell into the rally than participate in it. This is interesting -- despite the strong move in the dollar, we're not seeing a corresponding move in the A/D or CMF. In fact, the overall A/D trend is down and the CMF is neutral at best. In fact, despite the very important and strong technical move, we're seeing pretty weak technicals on the dollar, which makes me think the underlying rally is weaker than anticipated. As with the dollar, the IEFs underlying technicals are also surprisingly weak. The A/D line is moving horizontally, the CMF is decreasing as is the MACD. 1.) The strength of the dollar rally. Without an accompanying advance in the A/D and CMF, we're seeing shares advance on weak participation. That means there isn't a lot of excitement to this rally. 2.) The strength of the Treasury rally, which indicates there has actually been a lack of participation as well. Recently I've begun measuring the impact of energy costs not just by the price of West Texas Intermediate Crude (WTIC) which closed last week just under $80 a barrel, but also by the price of gasoline at the pump. That's because there has been a unique but marked divergence between WTIC and Brent crude in the last 12 months. Note the unusual divergence between the blue and red lines in the last year. Gas at the pump has clearly been following Brent, not WTIC. Professor James Hamilton previously indicated a 50% YoY increase with the necessity of about $130 Oil to meet his criteria for an Oil shock recession. If we measure in Brent, as opposed to WTIC, we just barely missed those recession criteria. It is important to note, however, that Professor Hamilton has advised that in his research, he has used the producer price index for crude petroleum, which averages the crudes by their importance to refiners. Further, he notes, if we go by this measure, we were still 7% off the 3-year peak at the end of 2011:Q1. Auto sales have indeed behaved as if there was an Oil shock induced reduction of demand beginning in May of this year. Because of the supply chain effects of the tsunami in Japan, we cannot know how much of the fall-off in demand was due to that vs. a reflection of high gasoline prices. The decline in consumer purchases of durable goods in the last few months has been an important part of the weakening economy. With the effects of the tsunami wearing off, September auto sales reported next week will assume an added importance. Via Calculated Risk and the LA Times, for the first half of the month, sales were encouraging. The oil market is in a clear downtrend, with resistance at 90 and support at 80. The MACD has given a sell signal and the EMAs are bearishly aligned. Prices have broken a short upward sloping trendline over the last week, and printed a very negative downward bar on Thursday. 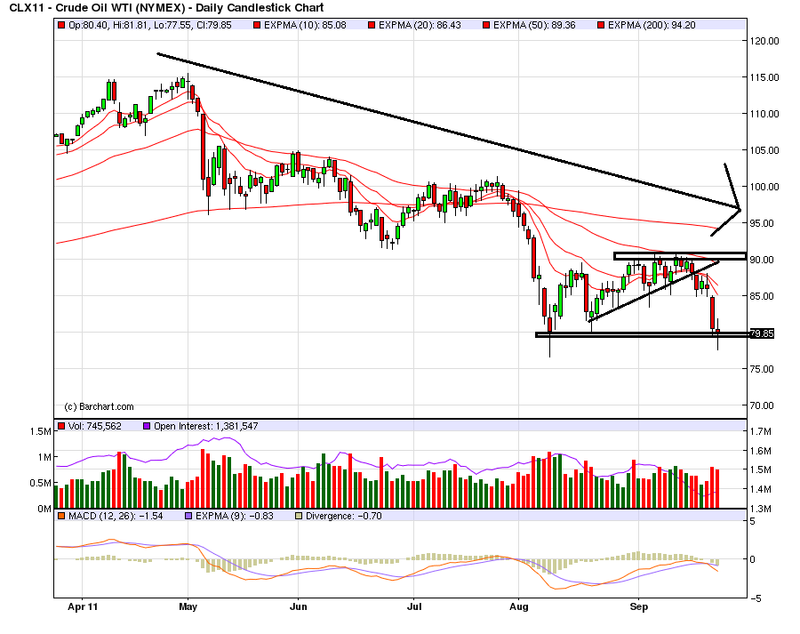 If prices break support at the 80 level, there is ample downside room on the chart. The 5-minute chart shows the complete and total breakdown last week, when prices strongly moved through the 85 price level. The chart also shows there is a fair amount of technical support at the 80 area. Gold fell out of bed last week. Prices moved through support a bit above 172, gapped lower an consolidated between 168 and 179 and then gapped lower again and moved lower for most of Friday, ending the week near the daily lows. The daily chart shows extreme negative action. Prices gapped down sharply, printing two large gaps on increasing volume. Prices -- which had run into resistance at the 10 and 20 day EMAs have now moved through the 50 day EMA on a strong downward bar. 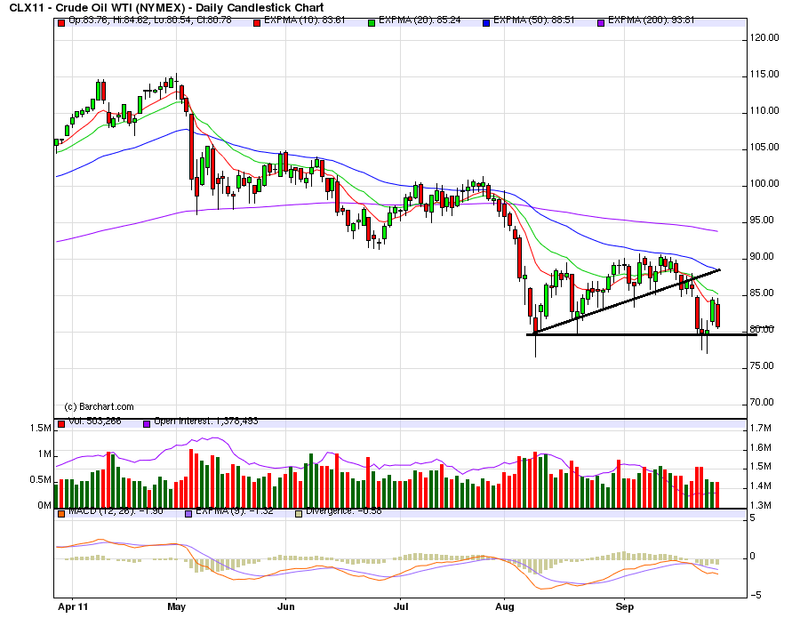 This is a big sell-off in progress, with prices looking to find ultimate support at the 200 day EMA. First, remember that the 114 area is a fib area. 112 is also an area of support established over the last few months. The market once again tested it and it -- once again -- held (at least so far). The short term EMAs (the 10 and 20 day EMAs) are still vacillating around neutral, not giving a strong indication in either direction. However, the longer term EMAs (the 50 and 200) are in clear downtrends. Plus, price is below these technically important EMAs. The overall tone of the equity markets is still very negative.